This picture was part of a hanger attached to my front door today. Before it went to the recycle bin I thought I would use it point out some neuromarketing you might not know about. Notice the part that says, “Just in time for back-to-school shopping.” We see these “just in time” messages for every occasion. 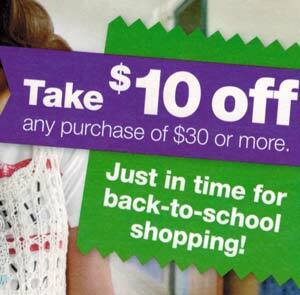 Newsflash: the executives weren’t hammering out details on whether this offer should be $9, $10, or $11 off. This decision was not made at the very last minute possible to get a special deal in time for this particular shopping season. Sorry to burst your bubble, but this was decided months ago – just like every ad campaign. Follow-up to the newsflash: The “buy now” message takes a lot of shapes. You just need to know what you’re looking for.